Below are five tips to improve your spring cleaning and ease your allergies and asthma. Fresh air? Don’t open that window! – Although spring breezes are very tempting, it’s better if you keep windows closed during the spring allergy season. Breezes and open windows can bring in unwanted pollen that can make your allergies flare. Keep windows closed, including in your car where you should use your air conditioning system as the first line of defense. Use an arsenal to blast allergens – It’s not easy to clean your whole house, but there are some tools that can help. Change your air filters every three months and use filters with a MERV rating of 11 or 12. 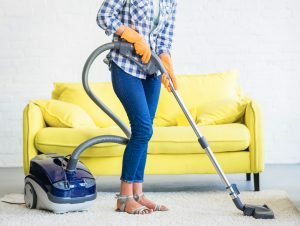 Vacuum regularly to help reduce the presence of dust mites. Use a cyclonic vacuum, which spins dust and dirt away from the floor, or a vacuum with a HEPA (high-efficiency particulate air) filter. Wash bedding and stuffed animals weekly. Start medications before symptoms begin – Although spring starts in March, spring allergy symptoms can begin much earlier. Start taking your allergy medications two to three weeks before your symptoms usually begin to appear to lessen your worst symptoms. It’s probably not possible to entirely rid your home of allergens. That’s where a board-certified allergist can help. Allergists are specially trained to help you take control of your allergies and asthma, so you can live the life you want. Give us a call at 856.262.9200 and start feeling better today!